Good Morning and Happy Tuesday!! How was your weekend? After a busy week, I ended up not doing anything over the weekend and loving it! It was the perfect weekend for a little recharge and relaxation. This blue striped off the shoulder top is a great mix of both classic and trendy for Spring. When I think Spring prints, I have to include blue and white stripes. It’s as Spring for me as gingham and florals. 🙂 It’s a classic print that can be dressed up or down and worn a variety of ways. This classic print is given a little trendy vibe with the off the shoulder style. The band on this top is really good at holding this top in place and is not too tight. I styled this top for a fun evening out with jeans and some pops of color, but you can also pair it with white shorts and wedges for a daytime outfit. 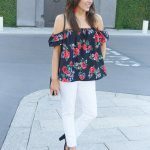 I hope you’re week is fabulous and don’t forget to check out the Style File Link Up at the end of the post for more style inspiration! Thanks for swinging by today! OMG! Love this top.. those heels are perfect too! I am totally in the market for a vertical-stripe top, and this one is so cute! 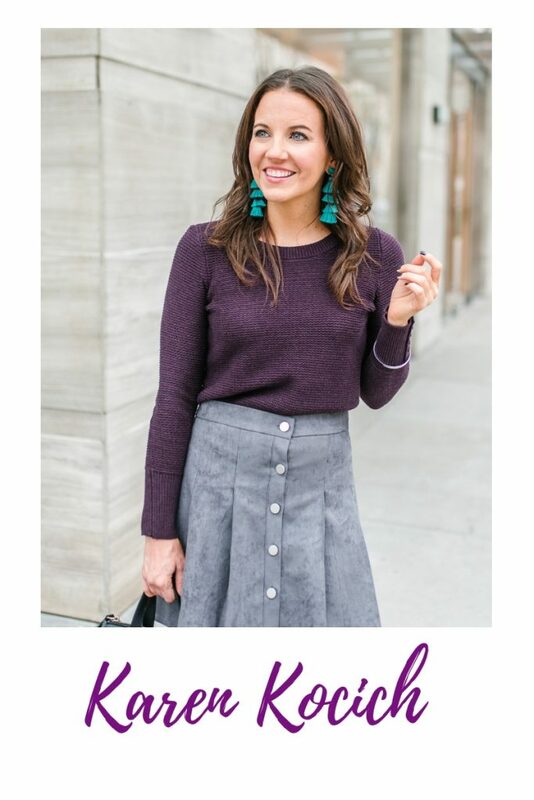 I’m cohosting a linkup this week and would love for you to stop by and share this look! I really like your blouse, the off the shoulder look is so pretty! Stripes are always so perfect, yet I love how these are vertical instead of the usual horizontal!! Very cute! I really like the contrast of the purple clutch! My DL 1961 black jeans are one of my fave purchases! I LOVE the pop of purple with this outfit. Super cute. Yes I love mine! These are like 3 years old and still look new! Such a chic striped top Karen! I love the pop of color with the clutch. Thanks for the link up!